Washington, D.C. – Cooking outdoors was once only a summer activity shared with family and friends. Now more than half of Americans say they are cooking outdoors year round. So whether the snow is blowing or the sun is shining brightly, it’s important to follow food safety guidelines to prevent harmful bacteria from multiplying and causing foodborne illness. Plan to drive directly home from the grocery store. You may want to take a cooler with ice for perishables. Always refrigerate perishable food within 2 hours. Refrigerate within 1 hour when the temperature is above 90 °F. At home, place meat and poultry in the refrigerator immediately. Freeze poultry and ground meat that won’t be used in 1 or 2 days; freeze other meat within 4 to 5 days. Completely thaw meat and poultry before grilling so it cooks more evenly. Use the refrigerator for slow, safe thawing or thaw sealed packages in cold water. For quicker thawing, you can microwave defrost if the food will be placed immediately on the grill. A marinade is a savory, acidic sauce in which a food is soaked to enrich its flavor or to tenderize it. Marinate food in the refrigerator, not on the counter. Poultry and cubed meat or stew meat can be marinated up to 2 days. Beef, veal, pork, and lamb roasts, chops, and steaks may be marinated up to 5 days. When carrying food to another location, keep it cold to minimize bacterial growth. Use an insulated cooler with sufficient ice or ice packs to keep the food at 40 °F or below. Pack food right from the refrigerator into the cooler immediately before leaving home. If you’re eating away from home, find out if there’s a source of clean water. If not, bring water for preparation and cleaning. Or pack clean cloths, and moist towelettes for cleaning surfaces and hands. Cook food to a safe minimum internal temperature to destroy harmful bacteria. Meat and poultry cooked on a grill often browns very fast on the outside. Use a food thermometer to be sure the food has reached a safe minimum internal temperature. Cook all poultry to a safe minimum internal temperature of 165 °F as measured with a food thermometer. When reheating fully cooked meats like hot dogs, grill to 165 °F or until steaming hot. 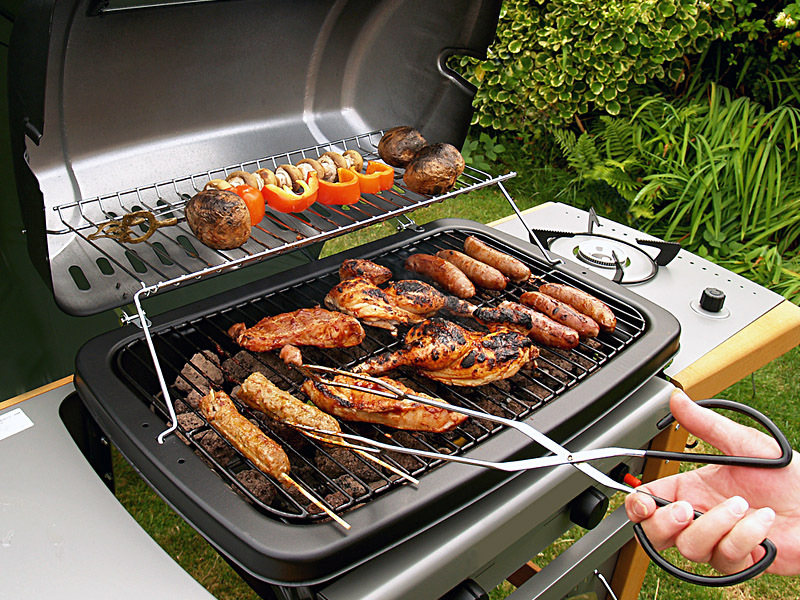 After cooking meat and poultry on the grill, keep it hot until served — at 140 °F or warmer. Keep cooked meats hot by setting them to the side of the grill rack, not directly over the coals where they could overcook. At home, the cooked meat can be kept hot in an oven set at approximately 200 °F, in a chafing dish or slow cooker, or on a warming tray. In hot weather (above 90 °F), food should never sit out for more than 1 hour. Refrigerate any leftovers promptly in shallow containers. Discard any food left out more than 2 hours (1 hour if temperatures are above 90 °F). Smoking is cooking food indirectly in the presence of a fire. 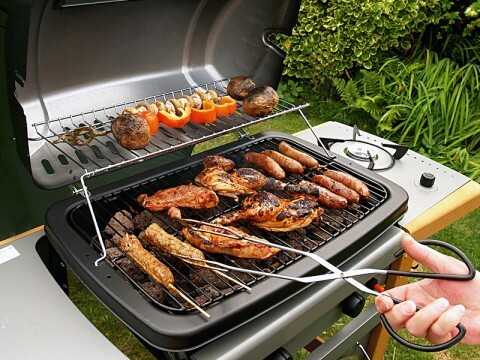 It can be done in a covered grill if a pan of water is placed beneath the meat or poultry on the grill; and meats can be smoked in a “smoker,” which is an outdoor cooker especially designed for smoking foods. Smoking is done much more slowly than grilling, so less tender meats benefit from this method, and a natural smoke flavoring permeates the meat. The temperature in the smoker should be maintained at 250 to 300 °F for safety. Cooking may require 10 to 12 hours or more and is difficult to estimate. A food thermometer must be used to determine the meat’s safety and doneness. There are many variables such as outdoor temperature, the size and thickness of the meat, and how fast the coals are cooking. Bacteria, Beef, cancer, Fire, Food Safety, Lamb, Meat, Outdoor Cooking, pork, Poultry, Steaks, U.S. Department of Agriculture, United States Department of Agriculture, Veal, washington d.c.